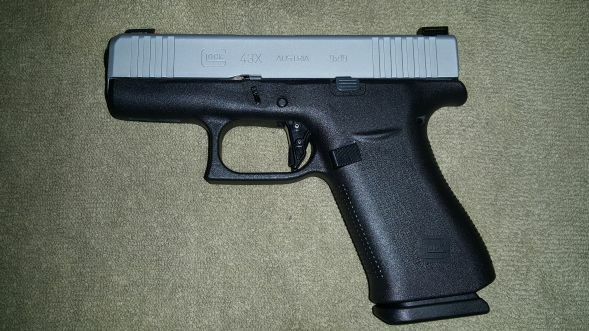 Well just could not get out of the gun shop today without buying the new Glock 43X with the Ameriglo night sights. Great night sights for these 61 year old eyes(I need all the help i can get). Should serve well as a pocket gun. Thoughts on this new little toy? I have the original Glock 43. When paired with a +2 extension from TTI I can get a decent 3 finger grip on it and it shoots quite well for a 3.5” bbl gun. I handled a G43X the other day at the range. It felt good in the hand. The extra width of the frame was actually an improvement (I run a Hogue grip sleeve on my G43). I didn’t have my G43 on hand to compare how close the grip length of my G43 w/ +2 extension compared to the G43X, but people who have say it’s really close. So my G43 w/ +2 = 8 rnds vs. G43X which holds 10 rnds in the same size package...nice. I have a 43. It makes sense to me. Small concealable 9mm. Yes, the capacity is disappointing. I have 8 round mags on hand for it but if I want a pkg that big I might as well carry my MP shield. The 43 is nice thin flat and light. It's easily concealed owb but I would not call it a pocket gun. Realistically, the profile is the same size as my g26 and that holds 10 or 12+1 and carries beautifully iwb. So, the g43s niche is really limited to owb carry with the stock 6rd mag. For any other carry style or magazine arrangement it falls short of other choices. Now, along comes g43x. Same gun longer grip. That long grip eliminates the one selling point of the original g43. It's now nearly g19 profile in the area that is not concealed in the holster or in the pants. If I'm going to have that much grip poking out I might as well carry a g19 or g23. I see no purpose for thec43x except for non ccw range use. Th g48 on the other hand does have appeal to me as a good fit for small handed women and youth. I will acquire one and use it with students and range guests to afford them a reasonable centerfire caliber weapon that fits their hand and has the sight radius and mag capacity necessary to make range time fun. Ill probably be picking one up once they get into the blue label more readily. I have a Glock 43 with Pearce PG-43 grip extension, I had the Pearce PG-43+1 grip extension which added a round but had feed issues. The PG-43 grip extension I do not have feed issues. I picked up a Glock 43X with Ameriglo Bold sights and I think the fuller grip is great. I added an Overwatch Precision Drop In Trigger Kit with a TAC trigger. I have two leather IWB holsters for my Glock 43 and the 43X fits both no problem. I've been wanting a polymer single stack 9, the Glock 43 was almost there and now the 43X looks to be what I wanted.